Day two of Electric Picnic is just as eventful as the first day, but in an entirely different way. On the first day, you see people are a little more conscious, they’re more easily peeved by the rain or a little disinterested in the many fantastic acts playing around them. By the second day, the campsite has become their second home where the breakfast bacon box washed down with a can of beer at the Salty Dog restaurant is the staple diet and if you’re not covered in muck, you haven’t been partying hard enough. 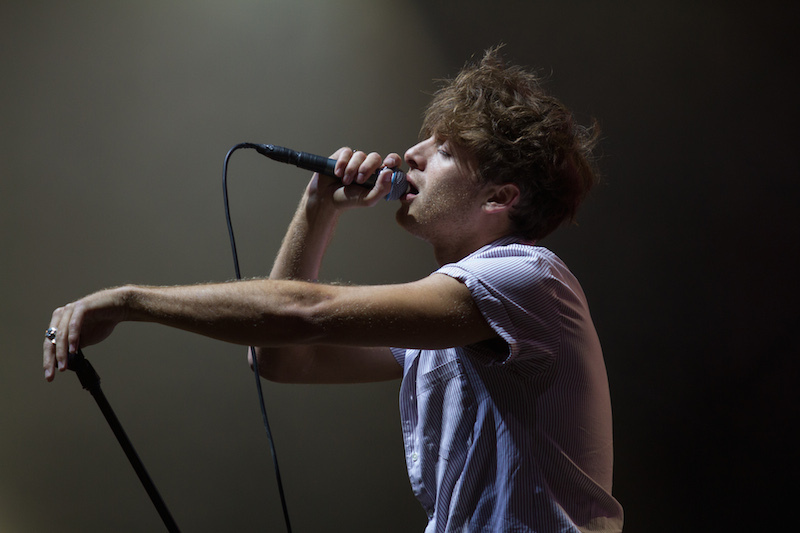 Nonetheless, there’s an electrified atmosphere to it all, a gentle hum of excitement as many agree that Saturday night is the biggest night with headliners like Portishead and Paolo Nutini taking the stage alongside current chart champions like Hozier. There’s a brilliant mix of sounds, ranging from the techno-dance makers like Metronomy to home-grown talent like Raglans. My greatest wish for EP is that I could clone myself so I could be at every stage, there’s simply too many great acts taking different stages at the same time. Of course, as well as being torn with what bands to watch, I also managed to be late to the first one I wanted to see, “The Academic”- just managing to enter the tent as they really seemed to get into the swing of things. No fear of these guys being a warm-up act anyway, they were happy to wake up the residents of Electric Picnic with their unique blend of indie-rock, which was particular true as they played their track “Forrest”. The Little Big tent was filled with eager fans as the boys played tracks like “Bear Claws” (I’m definitely going to invest some time in listening to their tracks just as soon as I get back to civilisation!) Their set was so fantastically lively and they still managed to keep a personal connection with the audience. Just as they went to play their final track, the lead singer noted that it’s always when they’re trying to be intimate with their fans that something goes wrong, in this case it was his guitar going momentarily out of tune. Regardless of this, they finished out their set to the rapturous applause of fans and demands of an encore. Raglans were also a band I was eager to see, I’d heard many things about their live performances and was dying to see how they performed. Initially, I thought they had maybe been one of the less fortunate bands who’s overlooked because there’s so many acts performing. Wrong. I went to get chips and came back to a packed tent. What started out as a peppering of fans had swelled into an almost packed tent. “Are you ready to party?” – This was the fantastically confident way in which the boys spoke to the audience made it obvious that the bigger stages are where they belong; much like their manner, their set was filled with a sense of animated enthusiasm. This is the kind of band you want to do an air-punch to. Spies were just as passionate in their performance, treating the Little Big Tent like it was a stage in Glastonbury and drew in the crowds with ease. Their lead singer has a fantastic set of lungs on him, I’ll give him that, the way he’s able to belt out their song is an impressive feat, he holds a note with all his might throughout his songs, which only emphasises his talents as a singer further. 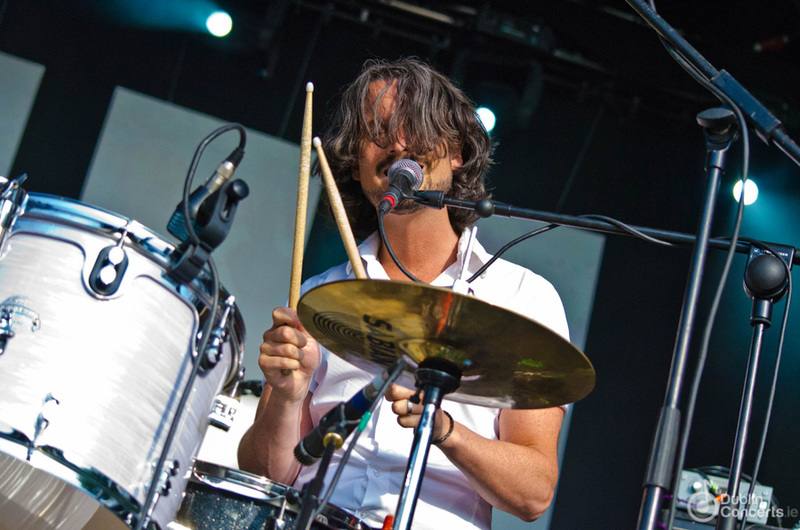 The crowd was in full swing when they played their latest release, “Moosehead”; rather than being an act who simply tells you to buy their new track, Spies show you why you should give them a listen. Their performance was reflective of the dazzling array of home-grown talent that’s performing at Electric Picnic, which I didn’t even realise we had; Electric Picnic is not simply a chance to see your favourite bands, it’s basically a way of updating your iPod with some unequivocally wonderful bands. Now, We Cut Corners, I’m going to admit it, I wasn’t too familiar with their work before Electric Picnic, I quickly learnt to love it when I heard them perform today. What a powerful pair they are; with the dynamic duo quality of the White Stripes and the powerhouse vocals of Biffy Clyro, I was wondering why I hadn’t listened to them sooner. The clatter of drums and the enticing chant of “it’s a pirate’s life for me” whilst performing “Pirate’s Life” demonstrated that the audience present was a heavily made up of devoted fans, the clapped and chanted along to each time they were called upon. “Blue” was received with even more delight, the gentle waver in vocals made it feel deeply personal. Then again, We Cut Corners clearly don’t wish to limit themselves, they burst into their song “Leopard” with a powerful clash of drums and guitar. The lyrics “hairline thins but plotline thickens” left me with a smile on my face to say the least, these boys are songwriters to their core. Even more impressively, they paid homage to one of tomorrow’s big acts, Sinead O’Connor, performing a rock-infused version of “Mandinka”. Cathy Davey is the little powerhouse that just blew everyone away, from a distance it’s hard to think her voice would work on such a big stage, yet she filled the tent with her own shimmering vocals. I say shimmering because her vocals are almost like birdsong in their manner, so high and delicate, yet paradoxically powerful. She was just an artist that wowed the crowd. When she performed “Little Red”, it was twice as fast as normal, (she even admitted this herself) but it perfectly suited the audience as they swayed along. The flutter of Davey’s voice never one wavered throughout her performance and she seemed to revel in performing to such a substantial crowd. She’s another jewel in the musical crown of Irish talent on display at Electric Picnic 2014, her performance of “Ruben” just blew me away, the pitch of her voice is just remarkable. It’s amazing to see such talent being unearthed in our very own backyard. The Irish talent to be found on a variety of stages at EP is just astounding and hopefully will continue to grow the festival. The sky remained overcast for most of the day, so it was fortunate that acts like We Cut Corners were in tents, nonetheless, I’m pretty sure 90% of EP came out to watch Hozier perform (some people looked like they would cross hot coals to see the “Sedated” singer perform tracks from his fantastic album). 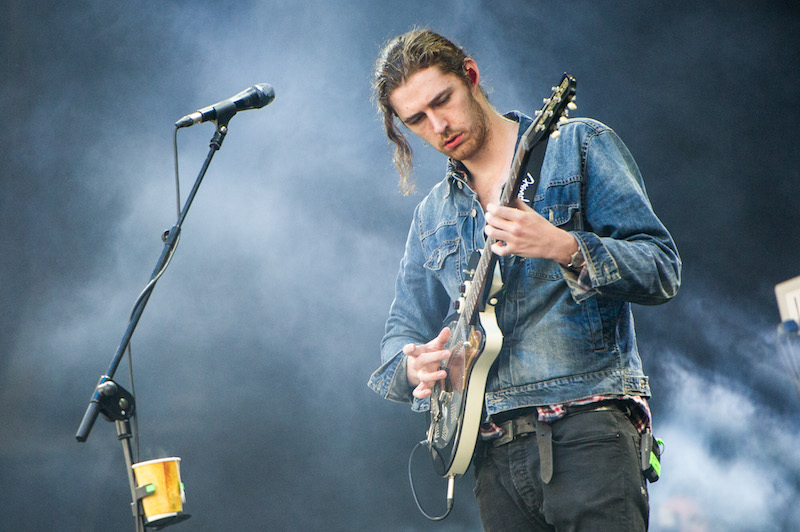 Hozier had a really smooth manner to his performance and his nervous chuckles as he spoke to the crowd suggested that he doesn’t quite realise what an amazing talent he is. Every single track he belted out was greeted as it should be, like it was musical gold handed down from the gods. The timbre of his voice was incredibly rich, and as he performed songs like “Work Song” and “Take Me to Church”, they were as perfect as they are on the album. Most interestingly was his cover of Amerie’s “1 Thing”, give the original a listen, I guarantee you, you never would have matched them and yet he was able to put his own musical slant on it. Shocked as always when an artist goes so beyond their own genre, I sat there with mouth agape at such an interpretation of a pop track. Metronomy were the act that really caught my attention, having witnessed them playing to a small sprinkling of people in a tent at Oxegen with flashing light bulbs attached to their clothes at they plated, I was eager to see if this band has managed to snag a few more Celtic followers, unsurprisingly, they had. The Electric Arena suited their performance perfectly, and despite the overcast weather, their performance lit up the faces of their fans. Their sound is definitely for the more techno lovers in the ranks of campers. The delight in the English group’s performance became clear as the cheering swelled, and when the band played “Reservoir”, the audience just went crazy. This delight continued on as the group played “I’m Aquarius” and as they chanted along it was good to see Metronomy getting the warm Irish welcome they had deserved. The roar of the synth was almost deafening but not deterring, it was a feast for electro-lovers as Metronomy lit up EP with their unique sound. Unsurprisingly, Paolo Nutini was one of the biggest draws of the night and he burst into his set with his latest musical release, “Scream”, which was probably the most exuberant way to kick off a set, everyone instantly knew the track and there was a rush to catch a glimpse of the Scottish rocker perform his set. He had instantly set a brilliant tone for the night, his performance simply went from strength to strength, playing a mix of old and new tracks, never lingering on any album too much. His performance of “Jenny Don’t Be Hasty” was considerably different to the one that fans would be familiar with but no one was complaining in the slightest; it had a simmering quality to it, reflecting the more jazz/blues element that’s found in his latest album, “Caustic Love”. When he played “Last Request”, all of the main stage seemed to slow down and pause, the vocals were so emotionally-strung, it was just palpable, it was a beautiful live version of the song that helped him break out. I caught about twenty minutes of London Grammar but that was more than enough to give me a taste of this amazing, young group with the old school voices. The tent was packed to see them and I could barely even make out the figures on stage, it didn’t matter in the slightest as the lead vocalist burst forward with her powerful sound. Their soulful sound, particularly of the song “Hey Now” continued to draw in people for the time I was there and as I left, it was clear that the audience had far surpassed the confinement of the tent, with people willing to stand on the outskirts just to catch a stunning live rendition of their songs, specifically “Strong”. There seems to be a massive development in their fan base since the last time they played in Ireland, which they themselves acknowledged but I’m not that gobsmacked, they have the soaring qualities that demand attention and recognition. Portishead was a firm favourite of the night with young and old, they didn’t hit the stage minute late and the entire thing was absolutely haunting. Their set was done in a sombre manner, opening in almost darkness apart from the spotlight bathing lead singer, Beth Gibbons. It was like a sleeping dragon awakening as they performed tracks like “Silence” and “The Rip”. There was a lingering quality to their sound that perfectly befitted the time of night they were playing, the witching manner to their music was almost cloying. It’s known that Portishead don’t care too much for media attention, which made their set seem even more fitting, there was a mysterious quality to the entire thing that seemed to leave people entranced as Gibbons’ vocals haunted the audience.